Harmonix is apparently going to reveal a new game tomorrow. Harmonix is announcing a new game tomorrow (it's not @RockBand or @Dance_Central). Stay tuned for the exciting news! Normally I hate reporting on these sorts of stories, as that single sub-140 character text blurb is the entirety of the news here. Harmonix is going to announce a new game tomorrow. There. You are now informed. Congratulations. However, if this game is linked to neither the Rock Band nor Dance Central franchises, we're baffled as to what it might possibly be. Harmonix has always been a development house whose games are built around music, so it just stands to reason that this new mystery game will also heavily feature popular tunes in some capacity. But if Harmonix has already covered faux bands and faux dance competitions, then how else could the firm build a videogame devoted to music? Now, this is a long shot, and is probably not at all what Harmonix has in mind, but since the gaming industry is currently stuck in an unending miasma of "old is new again," it makes a lot of sense to think that Harmonix might create a new entry in its Frequency/Amplitude franchise. 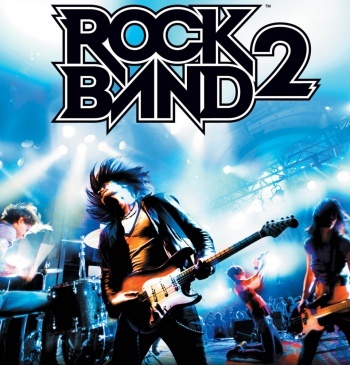 Granted, I'm a massive fan of these titles, so this is probably just wishful thinking, but the relatively recent Rock Band Blitz was quite obviously based on the gameplay seen in the two aforementioned titles, so why wouldn't Harmonix continue down that road for a new game? Truth is, the company probably has a whole new franchise to show us tomorrow and we aren't likely to guess its identity until they come out and just tell us what they're talking about. Expect a full report tomorrow, whenever Harmonix opts to spill the musical fruit.